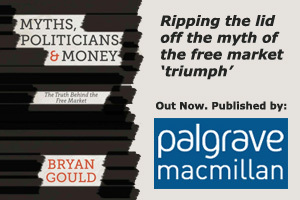 It was significant that, in the seven issues that Tony Blair – in his article last week in the New Statesman – advised Ed Miliband to focus on, there was no mention of the state of the economy. It is true that Tony never had much interest in or knowledge of economic policy – a deficiency that might have been an exacerbating factor in his precarious relationship with Gordon Brown. But it is nevertheless surprising that, in identifying the big issues that warrant attention, the parlous state of the economy slipped under the radar. Tony Blair is not, of course, alone among leading politicians in disavowing any interest in economic affairs. Most are content to accept advice from supposed experts, which usually means (and was certainly true in the case of Gordon Brown) that they have no option but to go along with whatever may be the prevailing orthodoxy. Yet the issue of how an economy should be run and in whose interests is surely the central issue in democratic politics. The ability to think for oneself and to judge the merits of conflicting views should surely be a minimum requirement of anyone who seeks to run the country. We see today where the orthodoxy of the past thirty years has got us. It is one of the welcome changes that Eds Miliband and Balls have brought about that there is now a disposition in the Labour party to challenge that orthodoxy. There is certainly an appetite for such a change by virtue of a growing if belated realisation in the general public that the old nostrums have failed. What is needed now is more courage, not less – a focus on positive change (which these days means no more than a moderate Keynesianism) and a conscious effort to move the debate’s centre of gravity; the Blair advice to fight shy of any genuine clash of ideas is surely misplaced – not only representing a missed electoral opportunity but a betrayal of the interests that Labour should be fighting for. Labour should be ready to take on the tired and discredited proponents of austerity, monetarism and the “free” market with some bold new (or, in most cases, revived) thinking. What about, for example, abandoning the backward-looking and static view of the economy taken by monetarism (and the irrational reliance on austerity to recover from recession) in favour of a recognition of the great power of a competitive market economy to grow – like the US at the outbreak of World War II, the Japanese in the 1960s and 1970s, and the Chinese today? The new Governor of the Bank of England is signalling that he is already looking at this approach. What about addressing that issue of competitiveness, or lack of it, that has held us back and constantly threatened inflation and trade deficits when we have tried to grow, by making improved competitiveness the central determinant of policy – as Singapore does? Why not tackle that issue by ensuring that – as Keynes warned – a shortage of money (for which read credit) does not hold us back, but that the credit that is created is put to productive purposes by being channelled, with the aid of an industrial strategy agreed with government, business and banks, into strengthening our neglected manufacturing base? What about using specific and focused measures to control inflation through restraining bank credit creation for non-productive purposes, so that the real and positive purpose of macro-economic policy – the productive use of all our resources, and the achievement of full employment in particular – become the main focus? And why not restore such macro-economic goals to their proper place in a democratic society – as the prime responsibility of elected and accountable governments, rather than being sub-contracted to unaccountable and self-serving bankers? And when government uses its power to “print money”, shouldn’t we ensure that those resources help industry through productive investment rather than sitting unused while they boost the balance sheets of the banks? And should we not nail forever the canard that we have to choose between social justice on the one hand and economic efficiency on the other? We have seen just how economically efficient is an economy that is run in the interests of a privileged few. There is nothing economically efficient about placing huge purchasing power in fewer and fewer hands, about allowing the wealthiest to treat the meeting of their tax obligations as a minor voluntary donation, about keeping large numbers out of work so that they are claimants rather producers, about leaving manufacturing flat on its back, about using vast amounts of money from both the taxpayer and the central bank to boost the banks’ balance sheets while both demand and investment remain depressed. A real debate about economic policy would produce great benefits – not just for the party brave enough to initiate it, but for the country as well.